Identical with the MALEV Il-14s which have landed at L.A.P.. HA-MAA (c/n. 147001325) is a regular caller at Kastrup. A rare shot showing a D.H.9 with the Estonian tricolour superimposed on R.A.F. roundels. New supersonic fighter for the U.S. Navy is the McDonnell F4H-1 which spans 38 ft. 5 in., length 56 ft. Aircraft is armed with Sparrow III missiles. Another maiden flight, this time the North American Sabre F-86E powered by a Bristol Orpheus 801 engine. The Sabre will be fitted later with the Orpheus 803 engine chosen for the Fiat G91 light fighter. New supersonic fighter for the U.S. Navy is the Chance Vought Crusader III with a span of 39 ft., length 58 ft., and height 16 ft. 4 1/2 in. Aircraft is armed with Sparrow III missiles. KC-135A-BN-1 Stratotanker 53-3126A shown at the Liege NATO display on 29th June 1958, was flown from Washington by General Curtis le May in 6 hours 44 minutes with Jacqueline Cochrane as passenger. The Dassault Etendard lVM naval version taking off on its maiden flight on 14th June. It is basically a standard IV with special equipment. The Bristol 192 is Europe's biggest military helicopter and is powered by two Napier Gazelle "free turbine" engines. Gross weight is 18,000 lb. and cruising speed is 125 m.p.h. 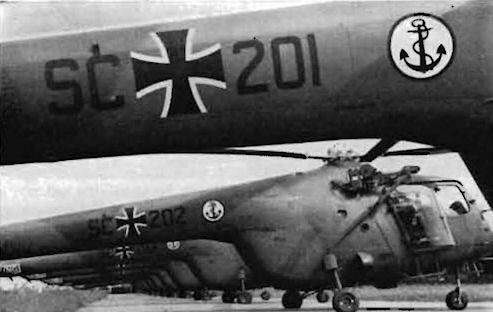 German Navy Sycamores SC-201 to SC-204 and Luftwaffe DA-391 prior to delivery via Lulsgate 17th June 1958. The new twin-turbine Vertol 107 helicopter has been ordered by the U.S. Army and carries the designation YHC-1. Outrigger floats can be fitted to the stub wings for amphibious operations. The Gladiator which Wing-Comdr R. F. Martin aerobatted at the recent R.Ae.S. Garden Party was immaculate in 72 Squadron colours and serialled K8032. 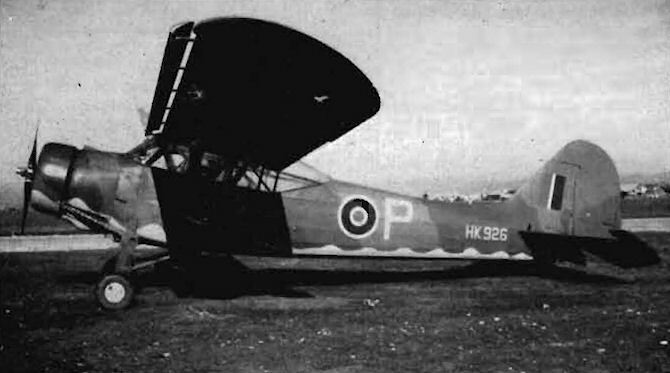 It is, of course, actually L8032 alias G-AMRK which originally saw service with 3 Squadron. Unusual American twin among the month's Airport Visitors was the Super Ventura N9060. 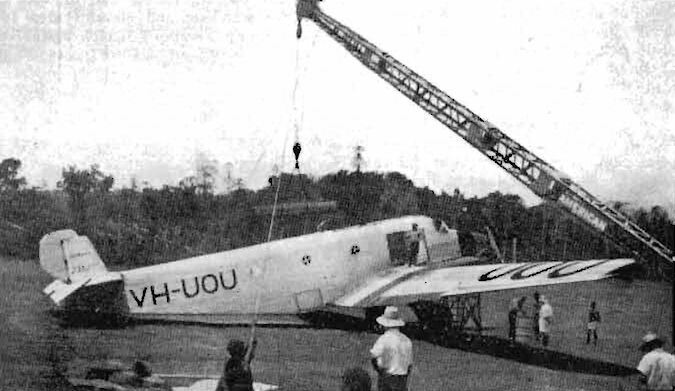 One of the three Junkers G-31s used during the development of the New Guinea goldfields. The first Viking ever to carry French civil marks, F-BFDN ex- G-AJBW, appeared at Blackbushe during the month. 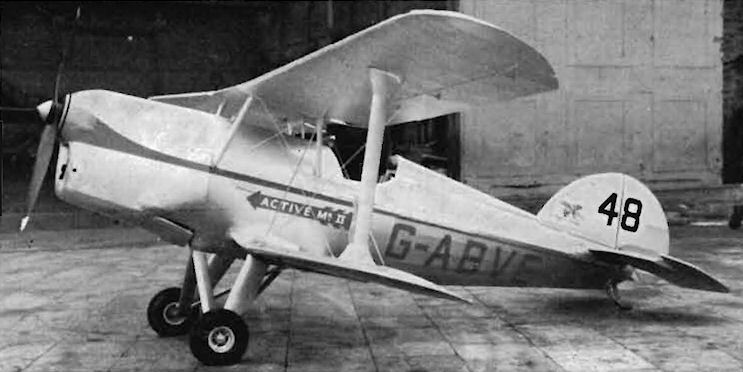 Every inch a thoroughbred, the rebuilt Arrow Active 2 G-ABVE made its first flight at Croydon on 26th June piloted by Mr. Norman Jones. Unusual American twin among the month's Airport Visitors was the Beech Travel-Air D-GARO. It was demonstrated at White Waltham on 22nd June. Vigilant HK926 in British markings. 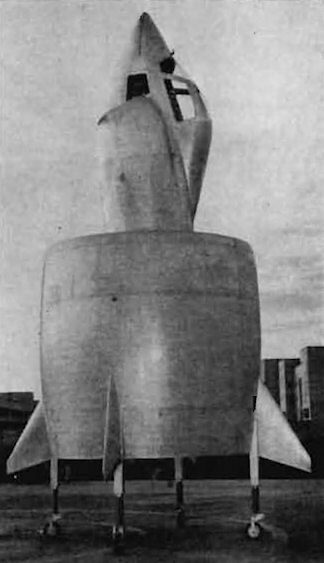 SNECMA C-450. The SNECMA Coleoptere is the ultimate development of the C.400 P.1 and P.2 Atar Volant and P.3 VTOL research vehicles. The engine, an Atar 101 turbojet, was developed by the SNECMA company and the airframe constructed by Nord Aviation. This version of the Coleoptere is subsonic but future versions should be capable of supersonic speeds. No details of dimensions, speed and weights have been released. It is expected that by the time these lines are read the aircraft will have made its first flight. One of the more unusual relatives of the tadpole is the Raab Moraa D-EKAD, photographed at Bonn on 16th June. 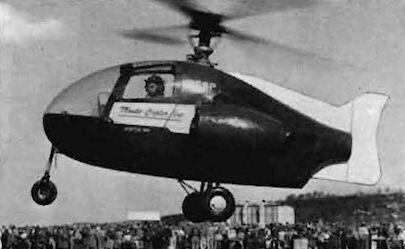 The Monte-Copter shown here differs greatly from the Model 10A published in the June 1957 issue of Air Pictorial. No details of performance, speeds, weights and designation are available. SIPA 1100. 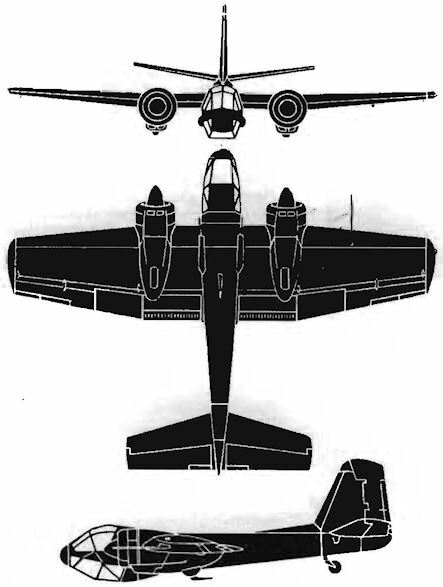 The Sipa 1100 has been designed as a general-purpose aircraft and will be used for reconnaissance, observation, photography and fire-patrol duties. The wing area is huge as is the vertical stabiliser. A well-glazed cockpit encloses a crew of three. Armament is mixed and will consist of two 20-mm. 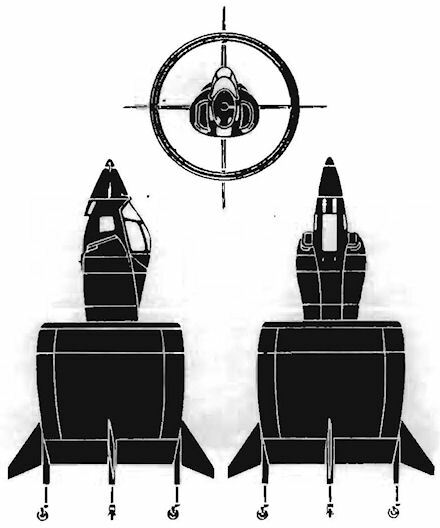 cannon, rocket pods, napalm tanks, light machine-gun pods and SS-11 guided missiles. Data: 48 ft. 3 in. ; length 37 ft. 2 in. ; height 15 ft. 9 in. Aerobatics by David Ince in the Poland-bound Olympia 419 G-APLT provided one oj the highlights of the R.Ae.S. Garden Party at White Waltham on 22nd June. 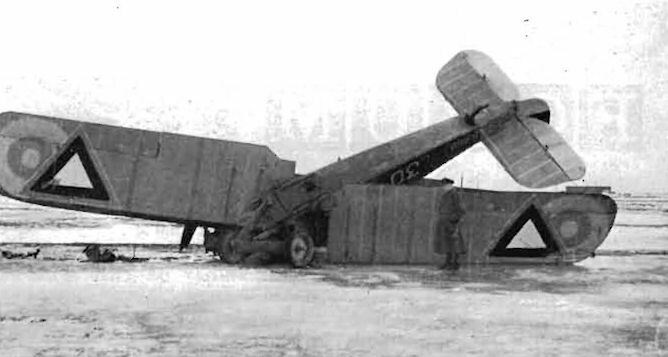 Rare photograph of a Spad XI fitted with a searchlight.